Vinay Gupta, co-founder and CEO of online travel agency Via.com, and Amit Aggarwal, co-founder and CTO of Via, have launched Tripfactory Pte Ltd, a new internet venture related to the travel sector. 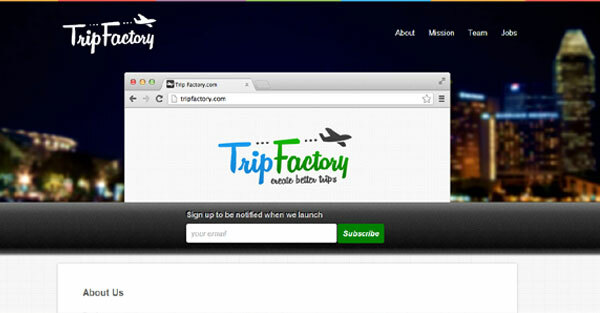 Tripfactory which runs a yet to be launched travel search site Trip Factory, has been incorporated in Singapore. The firm has also roped in Anand Kandadai, senior vice president of leisure travel at MakeMyTrip. Before joining MakeMyTrip, Kandadai worked with firms such as SOTC, Thomas Cook and Cox & Kings. Trip Factory aims to provide an easy search for travel content on the web. The portal, which is currently in closed beta, also aims to provide an integrated shopping experience like Amazon, built around trips, and provide users with the most relevant choices and dynamic packaging of those choices. It seeks to bring a customised approach to trip planning. As per a message on its site, "We believe future travel search is not only going to be semantic but is going to be on a platform where you can see the world as one, irrespective of whether it's online or offline." It has indicated that the venture will be, "â€¦ aware of where the users are and what are they engaged in and create smart profiles, which are an extension of their FB data and Open Graph. Profiles like these can then be used to make what potentially are the right personalisations and recommendations." When we contacted Gupta for more details on the new venture, he replied in a text message, "I will announce at the right time. Please give me time." According to Gupta's LinkedIn profile, he is founder and CEO of Tripfactory, and will continue to be a board member at Via.com. Via.com was founded in 2007 by Gupta and Aggarwal as an offline B2B travel site. It is owned and operated by Flightraja Travels Pvt Ltd. Via.com is currently functioning as a travel deals aggregator and ticket booking site. Its inventory includes ticketing in flights, hotels, holiday packages as well as car and bus services. The firm had raised $5 million from Indo US Venture Partners (now Kalaari Capital) in 2007 and followed it up with a $10 million round from Sequoia Capital in December 2009. The site has 20,000 partners across 2,400 towns and cities of India. It has more than 100 people working in countries other than Indian, including Philippines and Indonesia. Via.com has been growing inorganically for the past couple of years. It first acquired Jalandhar-based TSC Travel Services Pvt Ltd for an undisclosed amount in November 2011. It followed it up with acquisition of Bangalore-based healthcare products e-tailer LifeMojo in January 2012. Earlier this year, Via.com acquired online travel package booking site Travelmasti.com for an undisclosed amount.